When I worked at Heath Ceramics, Jeanne Kelley would come in fairly often to rent out dinnerware for photo shoots for what would eventually become her third cookbook, Salad for Dinner. Usually, I didn’t love doing rentals. It was a lot of work (for not that much money) and the food stylists who typically did the renting weren’t always very nice. But Jeanne was different—she was calm and kind. She also often brought along homemade cookies for the staff. And they weren’t just any cookies. They were special—chewy, nutty, chocolatey, and with just enough salt. When Salad for Dinner came out, we carried it at the store, but instead of taking photos of the recipes I wanted to make with my phone, like I often did with many of the books we carried at Heath (budget-living! ), I happily bought Salad For Dinner. It’s been a favorite of mine ever since—her blue cheese dressing recipe makes regular appearances at our house as does her simple croque-madame on greens. In preparation for this interview, I got my hands on her previous book, Blue Eggs and Yellow Tomatoes and even though it was published nine years ago, the recipes didn’t feel dated. 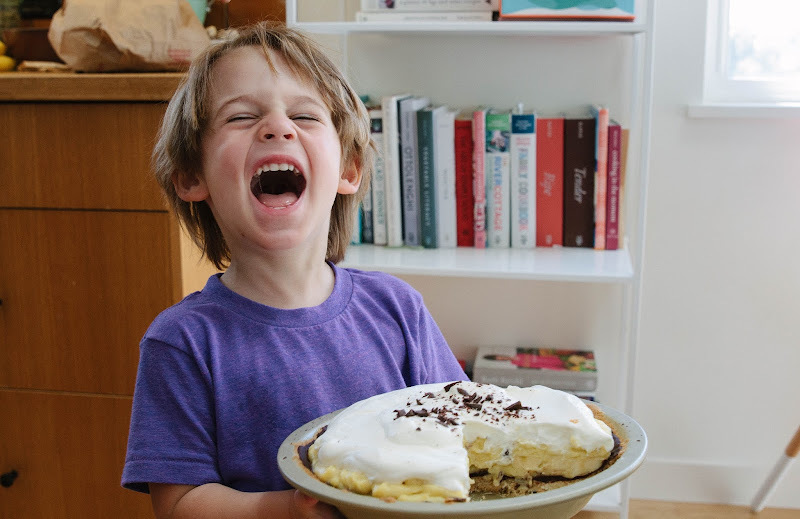 I made the “Easy Banana Cream Pie” right away. Since Jeanne lives on the east side of Los Angeles like I do, I was able to interview her in person instead of via email. She invited me over for lunch, and though I knew it was going to be delicious, once I got there I was immediately reminded that she is also a food stylist because everything was so beautiful. Just look at this salad, would ya? 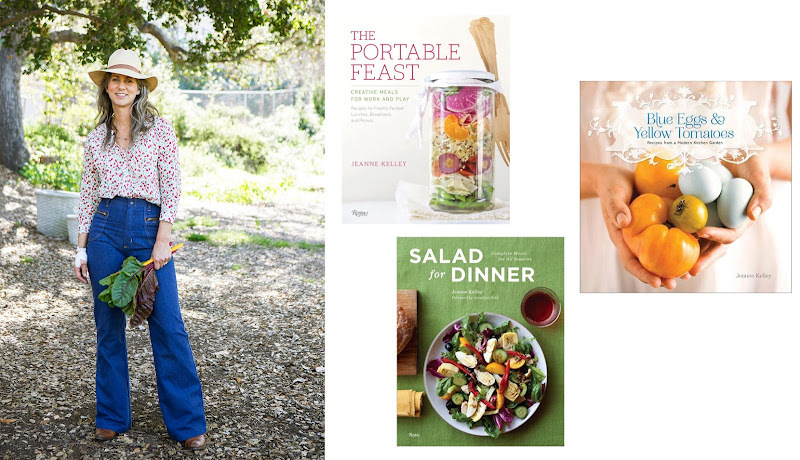 I was curious to talk to Kelley as she was a contributing editor at Bon Appétit magazine for 20 years, but also because her books and articles radiate an inspiring depth of knowledge about food, cooking, and gardening too. Her most recent piece for The LA Times focuses on rose geranium. Kelley writes, “If you don’t already have rose geranium in your garden, a friend with a bush could break off a branch for you to nurture in a pot of moist soil in full sunlight.” Of course I left our lunch and conversation well-fed, but I also left with my very own rose geranium branch (and some fresh chicken eggs and a copy of her latest book to boot). Amelia Morris: In the acknowledgments to Blue Eggs and Yellow Tomatoes (2008), you start by thanking your mom, someone who “cooked healthy and delicious meals for seven nightly.” You were one of five children? Can you talk a little about your mom and how she approached homemaking for such a crowd? AM: I can hardly imagine a third kid let alone five! JK: Yeah, I have three brothers, so she had three boys first [one right after the other]. And then came my sister, who is about 2½ years older than me, and she was probably the perfect girl baby. My mom said she never complained, she never did anything; she was so easy to neglect—in a way. So, I think I must have kind of been a mistake. But you know, she lived on a street where all the women had a ton of kids. It was easier then. They just sent them outside, sent them to other people’s houses. It wasn’t like today. We’re so focused and our kids are involved in so many activities. AM: And so many parents today have work outside of childcare and housework. Can you talk about raising your own two daughters and working for Bon Appétit magazine? JK: I had my kids relatively young for people my age; I was 24 when I had my first child. JK: Yeah, I mean, Celeste, my older daughter, is 29 years old. JK: I had some problems with endometriosis, so my doctor recommended that if I wanted to have kids, for me to do it [right away]. And I was actually married already. I really wasn’t ready, but we just decided to go ahead and go for it. I had a great job at the time too. I was a freelance recipe tester for Bon Appétit magazine. They didn’t have a formal test kitchen. They used to have people who would cook dishes at home and then transport them to the office; you’d reheat it, put it out for everybody and they’d taste it. It was great—it was a part-time job that paid well and I could do it from home. And then I had my first daughter and when she was about 18 months old, they finally built a real test kitchen and I interviewed to be one of the people who would work there full-time. So, I basically had the luxury of being with my baby until she was 18 months and then I got a full-time job. And the way we structured daycare—god, it was so expensive—we put her in a four-day a week program and my mom, who still lived in Pasadena at the time, took her every Friday. And also, because I used to cook for the morning testing, I would get to the office really early. I would leave before traffic; the baby wasn’t even awake yet, my husband would get her dressed, take her to daycare and then I would pick her up at 3:30pm in the afternoon. Oh, and to deal with traffic back then, they came up with this amazing thing where you got a three-day weekend every other week. So you were supposed to just add maybe 45 minutes to your workday and then you got every other Friday off. And it was just perfect. I don’t know why more people don’t do that because they’re gonna get that 45 minutes out of you. AM: So when you had your second daughter, what happened? JK: My girls are four years apart, so when I had my second one, I looked at my salary and then the expense of daycare for two kids, and there would have been no profit. So, after my second daughter was born, I decided to quit. And I started developing content for Bon Appétit Books on a freelance basis. And that was great. And plus I could fill in at the magazine when someone went out on maternity leave or someone was sick or traveling, or etc. I already had the training, so I could work in the test kitchen or the office. I could edit. [This was] all freelance. It was a great job. I loved it. And over the years, I started writing recipes for them. And kept with it. I did food styling and different projects. I basically worked for them up until they moved to New York. And that’s when they fired everybody. AM: And that’s when Adam Rapoport took over? And your relationship with Bon Appétit ended? AM: Well, they didn’t cover my book either, so now I know why! I’m curious though what you think about the current-day Bon Appétit. As I mentioned, I find it to be, ever since Rapoport took over, a rather soulless, largely trend-focused approach to food and cooking. JK: Well, I don’t know Adam personally. But he came from GQ. He’s got a very fashion-based point of view. And I think that’s how they feel they can make it survive or appeal to young people maybe, if they’re this food and fashion thing. But for me, I don’t think food and fashion necessarily go together. AM: And what about Gourmet? Did you like that or read that before it went under? AM: I think I heard that one too. And doesn’t Patchett take the blame for Gourmet’s downfall because she said she spent too much money on those trips? JK: That is one thing I heard—that when Gourmet went under, there were millions of dollars of unused edit… They had so much money that they could produce all of this wonderful content, but they didn’t necessarily have the advertisers [for it]. But that’s an interesting thing when you think about magazines and them going under and you think of Vogue, [it makes me] so frustrated. Bon Appétit is taken over by a young man who wears skinny jeans and it’s all about fashion and New York and it’s all this youth, youth, youth thing. And you look at Vogue, which is so successful and it’s run by older women. So why can’t we have women running these magazines? AM: I assume Bon Appétit is successful or else they wouldn’t keep doing it? AM: And aren’t they on the Internet anyway? JK: They’re on the Internet anyway, or they call their mom. So it’s like: why wouldn’t you focus on people who aren’t comfortable with the Internet? I guess geezers aren’t cool. AM: I don’t think geezers are “cool”! Which reminds me: Have you ever seen The Great British Baking Show? JK: No. I haven’t and I know I should. People say they love it because the people are really nice. AM: And they’re old! The first time I watched it, I remember thinking: Oh, there’s an old person on my television. JK: Not really. Because I find most of it sort of inane. But I’m bad in the sense that I sometimes feel like my whole world is so much about food, work-wise that I don’t necessarily like to watch shows about food or read about food. People will say, “Oh, you’ve got to watch Chef’s Table.” And I’ll say, “OK. I’ll give it a try.” But then I just forget. Maybe if I ever have some time off and I can iron or something, I’ll iron and watch a show. But sometimes I get a little bored with chefs. They’re great, but I don’t understand the elevation of chefs to this kind of celebrity status and this sort of authority about cooking. Because I think that when you cook for a restaurant it is so different than cooking at home. They’re like two different languages, but people don’t see that. When I worked in the test kitchen, I could see that chefs don’t cook with recipes. They go off the top of their heads. Therefore, they don’t know the difference between a quarter cup and a teaspoon. They’re just cooking by feeling, which is great. Everybody should know how to do that, but not everybody can. But I don’t think that should devalue a recipe. A recipe is a great tool. It makes me feel like: What happened to the home cook? Why doesn’t the home cook have a voice so much in the whole food movement anymore? Why is it so much about chefs? They don’t cook at home. And half of them don’t know how to make something super super simple. They come home from work; they’re so over cooking, it’s the last thing they want to do. AM: They also work all night, right? So if you had a family, when would you cook for them? JK: That’s another thing that bothers me about the whole chef-y thing. These people have bought into it! They’re like [takes a faux macho tone]: Yeah, we don’t get paid very much and we don’t have holidays and we’re never with our families, but yeah! We have our knife tats and we’re chefs! [Back to her regular voice] But you can still cook and have some sort of quality of life. AM: This reminds me of why I really like your cookbooks. They feel written by somebody who likes to eat and nothing is too fussy. I just made your banana cream pie and I love the press-in crust and how you just melt the chocolate right on top of the crust. Those are my kind of recipes. JK: I feel like you’ve got to make things easy or people aren’t going to do them. And I know that there’s this purist kind of ethos with a lot of cooking and that a lot of people would look at that pie and say, “Oh my gosh. You’re not rolling out the crust and blind-baking it and blah blah blah.” And no, I’m not, but I know that doing that whole process would add a whole other day. And I kind of just feel like: I want to cook something and be able to eat it. [Laughs.] I want it to be delicious and I guess I don’t really care about authenticity [or] if something is technically correct, if it’s good. JK: There was no Internet when I got chickens. It’s not like you could Google anything that went wrong with your chickens. You’d look at some dumb book and the books were always so involved—they’d be almost written for a vet or someone. So I would just figure it out and there was this funny guy at a pet store in Highland Park and I would go talk to him and ask him questions and he looked at me one day and he said to me, [takes a very serious tone] “Lady, your chickens are making you think.” [Laughs.] It was classic. And I was like, “Oh, right. Your chickens aren’t supposed to make you think. They’re just chickens.” You drive around in Mexico, Africa, Thailand, everywhere, the chickens are just running around. AM: Under the section, “Roosters?” you write, “I am often surprised at how often I explain that no, you don’t need a rooster to get eggs. Yes, you do need a rooster if you want fertilized eggs that hatch into chicks, but a hen ovulates, just as a female human does, with or without the presence of a male.” I’ve eaten so many chicken eggs in my life and I feel like I never really thought about this before—a fertilized egg vs. an unfertilized one. And it’s just moments like that when I feel really disconnected from my food source and like a modern jackass, basically. JK: [Laughs.] No, so many smart people have brought this up to me. You know, I did that thing—[talks self-mockingly] I was an exchange student in high school. I lived in the southwest of France out in the country and got to see where they kill the pigs and make the sausages. [Returns to normal voice] But we’re not going to live on farms. I don’t want to move to a farm. AM: Right, right. I guess I just worry that the more disconnected we get from our food source, it’s easier to lose touch with Mother Nature. JK: Yeah, my concern is with a lot of diet trends, which I think are so unsustainable. I’m supposed to be doing some recipe development for this German book project and they were telling me how in Munich and Berlin, poke is a big trend. And I’m thinking: "Oh, great. That’s just what we need: people in Central Europe eating raw tuna." Tuna is overfished. And if you’re going to eat poke, it’s supposed to be eaten fresh, so that’s why they eat poke in Hawaii where they’re on an island surrounded by it. The idea that it’s then flown off to all these places just doesn’t make sense. I also don’t think the paleo trend is super sustainable either. I sometimes wish people could think more about: well, what can we eat that’s good for our environment instead of [being] so self-centered with their eating. AM: Ah, well that kind of brings up this other question I’ve been asking everyone in this series so far, which is about this 30-day detox touted by Goop. Here are the first seven of fifteen guidelines: “1. No alcohol. 2. No caffeine. 3. No dairy. 4. No eggs. 5. No beef, no pork. 6. No shellfish, no raw fish. 7. No gluten.” What are your thoughts on detoxing? Have you ever tried one? JK: I guess I don’t quite understand the whole thing about detoxing. Am I naïve? What are these people doing? What toxins are they filling their bodies with? Vodka and cocaine? And if you’re somebody who reads Goop, aren’t you already into eating a lot of kale anyway? And all of the medical science says there’s nothing to it. I get the idea that if you’ve gone on a trip where you feel like you’ve eaten too much meat. Or maybe you got back from Italy and you’ve been eating a lot of pasta and cream, I could totally see you wanting to eat a lot of vegetables. Or if you were on a trip and you’d been drinking a lot. I get that you would want to take a break for a while. But I don’t understand these rigid diets. AM: Right. My problem is that I feel like my twenty-year-old self would’ve totally taken these kinds of detoxes very seriously. Because my main goal most days was to be pretty and thin. JK: Oh, yeah. My girls get mad at me all the time. One day I said something like, “Are you sure you want another piece of pie?” And they get so mad. They said: “You can’t body-shame me!” or something like that. But I just feel like: Yes, I cannot help but be a product of my generation, which was: I want to be pretty and thin. I remember being in high school and living off of Tab, cottage cheese, and carrot sticks. AM: You thought that was healthy? JK: I thought that was healthy. But this was also pre-Jennifer Lopez. We were all humiliated by our “thunder thighs.” We would tie sweaters around our waists to cover up our butts, but now you see girls and they’re proud of their bodies. And that’s great. AM: Where do you find your cooking inspiration? JK: Traveling. Or learning about a new ingredient and then reading up about it. I don’t go out to eat very often. A lot of times it feels like a chore. It’s hard to get in, hard to get reservations. But I look at the papers. And when I do go out to eat, I like to go to restaurants that do interesting things with vegetables. I’d like to go to Destroyer. When I worked at Bon Appétit, I used to have the opportunity to go to a lot of tasting-menu type places and I realized that I don’t like eating that way. I think it leads to palate confusion and I never feel good after those meals and [even though] you’re drinking very little, the next day I would feel like I’d gone on a bender. I don’t think you’re supposed to eat that way. AM: Where else in LA do you like to go? JK: I love Baco Mercat downtown. And he [Josef Centeno] has got this new one P.Y.T. that’s a lot of interesting vegetables. I like Everson Royce Bar. I feel like you can really judge a restaurant on their salad and they have a salad on their menu, I think it’s called The Boring French Salad. It is such a nice salad. It’s got really fresh greens, radishes and this really nice herby, buttermilk vinaigrette. The food there is so simple, but it’s done in such a quality way. AM: What is the dessert here? JK: So, I’m sort of on this rose geranium jag. I had a bunch of lime, so I made lime curd with rose geranium in it. And I had some blackberries that I’m going to sweeten with rose geranium. In my latest book, Portable Feast, I [do something similar]. I make this kind of crumble and layer everything in these jars, so they’re like lemon meringue pie jars. That way you can make the components and you can just have a little bit. Because if you make a whole pie, you gotta eat the whole pie. And if I’m home with a pie, I’ll eat it. Preheat the oven to 350°F. Butter a 9-inch pie dish. Combine the flour, sugar, and salt in a bowl. Add the butter and stir with a fork until moist clumps form. Press the dough evenly onto the bottom and up the sides of the prepared dish. Bake the crust until golden brown, about 20 minutes. Remove the crust from the oven and sprinkle it with chocolate. Let it stand until the chocolate melts, about fie minutes. Using the back of a spoon, carefully spread the chocolate over the crust. Chill or freeze the crust until the chocolate is set, about 30 minutes in the refrigerator or 10 minutes in the freezer. Bring the milk and vanilla bean to a simmer in a heavy, medium-sized saucepan over medium heat. Whisk the egg yolks, ½ cup of the sugar, and the cornstarch together in a large bowl. Gradually whisk the hot milk into the egg mixture. Return the mixture to the saucepan and whisk over medium-high heat until the custard thickens and boils, about 3 minutes. Remove from the heat and whisk in the rum. Cool the custard to room temperature. Whip the cream with the remaining 2 tablespoons sugar to soft peaks. Spread the whipped cream decoratively over the pie. Garnish the pie with chocolate shavings and additional banana slices. Amelia! You and the boys make that pie look so fun and delicious. Thanks much for featuring it. I hope it makes lots of parents want to bake a pie with their kids. I always have so many things to say after your blog posts! First of all, Salad for Dinner is in my rotation of top 3 cookbooks. I worked at a kitchen store years ago and, like you, used to take iphone snapshots of the cookbook recipes, but when the salad book showed up I purchased it immediately and then bought three more copies later to give as holiday gifts. So, I was so happy to see this interview! Now I want to run out and buy all of her other books. Such a bummer about Bon Appetite. I already have grown to dislike it over recent years, but hearing this behind-the-scenes insight made me even more sure that I will not be taking them up on their amazing offer for a YEAR subscription for only $10. They seem desperate for subscriptions and it's no wonder why. I need banana cream pie right now!! Thank you for another great interview. I just love hearing someone so down to earth and non-chef-y. Excellent interview! I was not familiar with Salad for Dinner so now I'm going to search out a copy for myself. Totally agree -- where *are* all the home cooks? It seems to me that the Internet (especially IG) is full of recipe developers and the only way to get noticed is to create your own recipes but at the end of the day someone's gotta cook from those blogs and books. (This is why I'm drawn to your space a) you write about interesting subjects b) you're cooking from lots of different books/blogs. Also: Isaac and the counter sandwich made me lol. Thank you. Yes to this: "I sometimes wish people could think more about: well, what can we eat that’s good for our environment instead of [being] so self-centered with their eating." I always thought Paleo was weird for this reason, as someone who was a vegetarian for a while. Also, I totally relate to her desire to find restaurants that do interesting things with vegetables. Most days all I really want is vegetables prepared well. @HAILEY thank you!! Though unfortunately, in real life, I'm not as cool. just ask Matt! @Kara thank youuuu! Cold wet veggies, hahahaaa. I have half a mind to interview you next. Watch out! @The Wednesday Chef SO glad to hear it, Luisa. I love these new posts! You should do a podcast... I'd subscribe!! Oh and Isaac with his sandwich... so so sweet! Love the knife tat comment - so true! Love this series. Keep it up! This is my favourite interview so far, maybe because I love a good dish. I've been enjoying all the interviews, hearing people's thoughts about home cooking, food trends, and just what gets you into the kitchen or around the table. Thanks for some great reads. @Dani Elis I *had* considered doing this series as a podcast but then it felt like I was taking on too much. Maybe someday though? @amanda a -- I love old people. Which reminds me: I gotta interview one!